Many homeowners choose to install shutters on the exterior of their homes to add visual appeal. Shutters add texture and color to the home's exterior. Exterior shutters are available in a variety of materials, ranging from plastic to wood to metal. Many shutters come finished in the color of your choice. Save money by installing your own shutters. Many homeowners choose to install shutters on the exterior of their homes to add visual appeal. Shutters add texture and color to the home's exterior. Exterior shutters are available in a variety of materials, ranging from plastic to wood to metal. Many shutters come finished in the color of your choice. Some types of shutters require priming and painting before installation and continued maintenance afterward. Some pre-finished plastic shutters have color throughout the shutter rather than a top layer of color. Color that permeates throughout the shutter cuts down on maintenance and refinishing costs. Measure along the side of the shutter and make marks according to the manufacturer's directions. Drill holes through the marks on the side of the shutter with a power drill. Hold the shutter next to the window to determine placement. 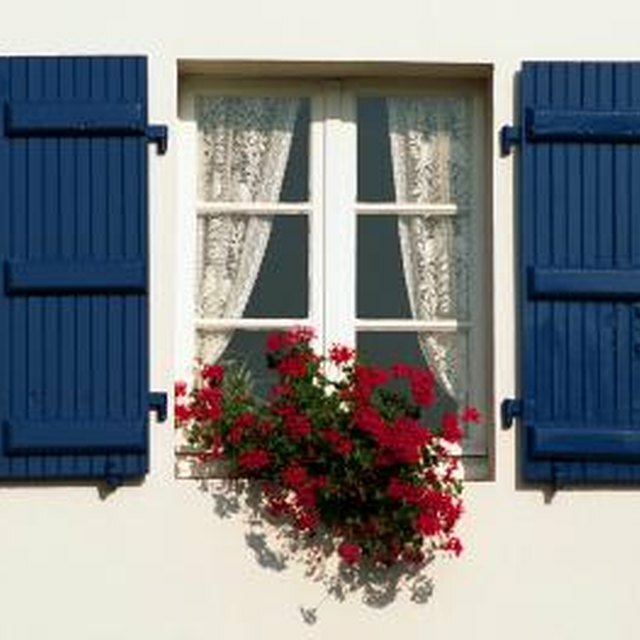 Measure the distance from the top edge of the window to the top of the shutter and then from the bottom of the shutter to the bottom of the window to ensure the shutter is centered to the window, if the shutters are taller than the window. If the measurements are different, adjust the shutter up or down to center it to the window. If the shutters will hang on a brick or stone house, line up the holes on the shutter with the mortar line if possible. Position a level along the top edge of the shutter. If the level's bubble is out of the center, adjust the shutter until the bubble is in the center of the level. Place the level vertically along the side of the shutter to check for plumb. If the level's bubble is out of the center mark, adjust the shutter in the correct direction until the bubble centers. Place a pencil through the pre-drilled holes along the sides of the shutter and mark the side of the house. Equip a power drill with a standard drill bit slightly smaller than the fastening screws. If you are drilling through a masonry surface, equip the drill with a masonry drill bit. Typically, manufacturers include the screws with the shutter. Place the drill on the mark and drill through the siding or into the mortar line to a depth that matches the length of the screws. If you are installing exterior shutters on a masonry surface, set masonry anchors into the holes by tapping them in place with a mallet. Align the shutter with the drilled holes or masonry anchors. Place the screw through the pre-drilled shutter hole and sink the screw into the exterior with a power screwdriver. Place the included screw cap over the screw head and press it in place to hide the screw head. Repeat for each shutter. Wear a dust mask, safety glasses and gloves when installing exterior shutters. Avoid hanging shutters when the weather is cold, as cold weather makes some types of siding and shutters brittle.